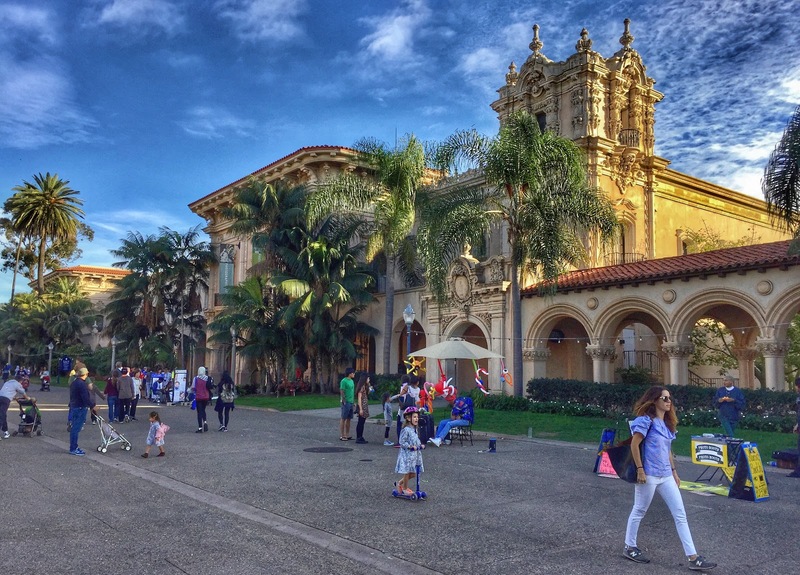 When making plans to include San Diego on this trip, one of the spots we thought we'd visit for sure was the celebrated San Diego Zoo, located in the city's Balboa Park. That put the park at the top of our agenda for today, but by the time we left, the zoo was still on our 'places to see' list. 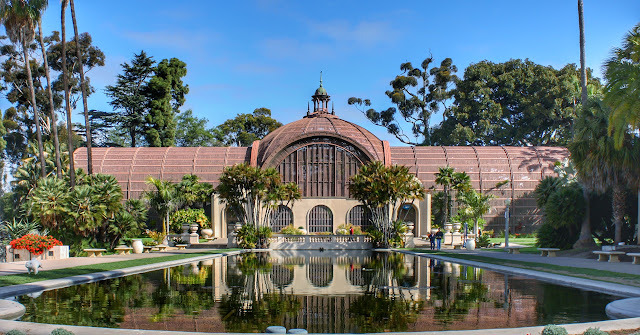 Like the slightly larger Forest Park which we visited in St. Louis last spring, Balboa Park is the heart of the city's green space and a beehive of cultural and arts activities. 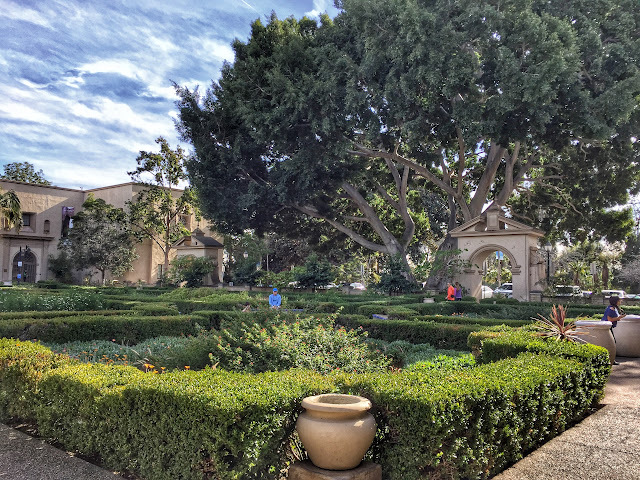 The self-proclaimed largest urban cultural park in America (and it would be cheeky to dispute this claim), Balboa is home to 17 museums, 7 performing arts centers and 17 garden spaces. 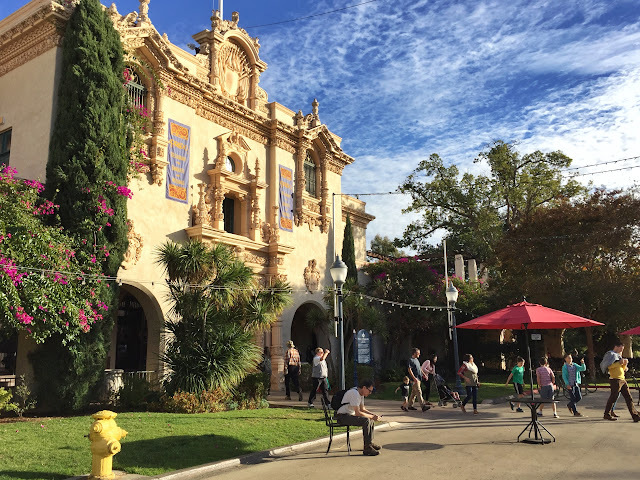 This means the park has a full calendar of performances, classes, concerts, and special exhibits, all in a beautiful setting of lavishly decorated classical Spanish architecture amid a lush landscape. WE HAD NO IDEA OF THE TREASURES AWAITING INSIDE. After stopping at the visitor center to purchase a park pass which would admit us to all museums and gardens (except the zoo), our first stop was the nearby Mingei International Museum, which collects folk art, craft and design. 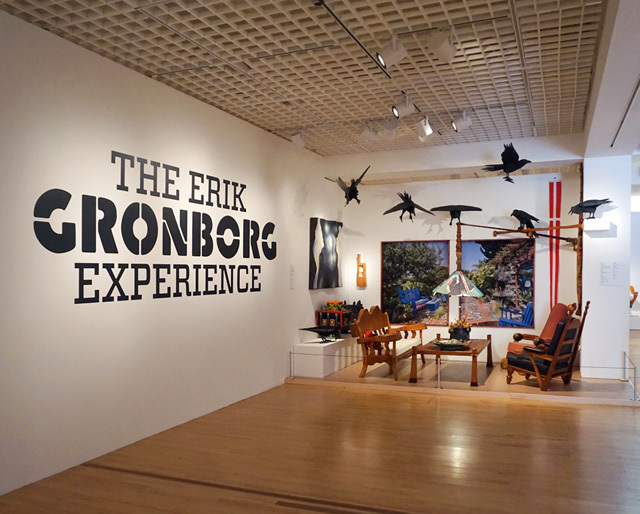 Upon entering, we were both immediately drawn to a first floor special exhibit of works by Danish-born San Diego artist Erik Gronborg. A retrospective of his work spanning some 50 years, the Erik Gronborg Experience brought together examples of his creations in a multitude of media, most notably sculptures in bronze and wood, furniture, and hundreds of fascinating ceramic pieces. 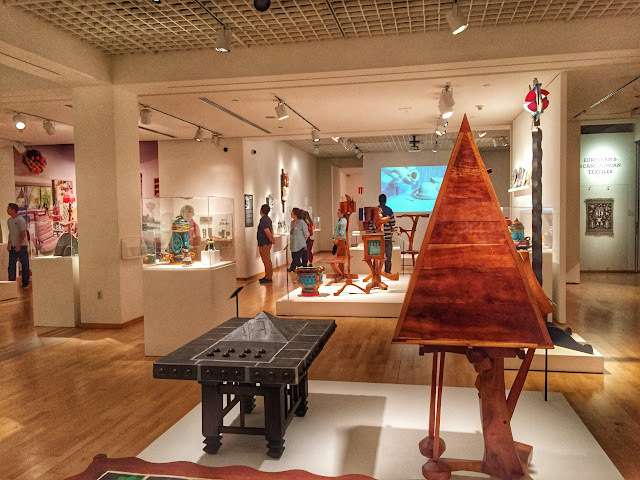 SAMPLES OF FURNISHINGS FROM THE ARTIST'S HOME WERE A SPECIAL FEATURE OF THE EXHIBIT. Both of us were captivated by the diversity and breadth of this creative artist. Since we're more invested in accumulating experiences than possessions, we've never had an urge to purchase works of art or antiques. But we agreed that should the urge ever strike, we'd seek out a piece by Gronborg. 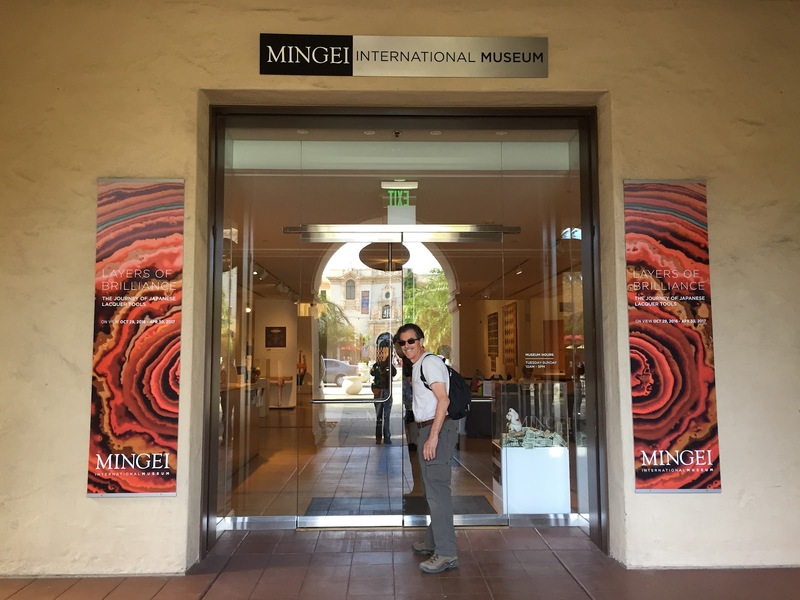 MINGEI MUSEUM HOUSED IN 'HOUSE OF CHARM' EXHIBITION BUILDING FROM 1915. Just a scrub-covered mesa when it was first designated a city park in 1868, Balboa developed slowly until it was selected to host the 1915-16 Panama-California Exposition, a major world's fair in its original sense, commemorating the opening of the Panama Canal. Funding poured into the construction of roads, landscaping and a myriad of buildings in the Spanish Renaissance style. 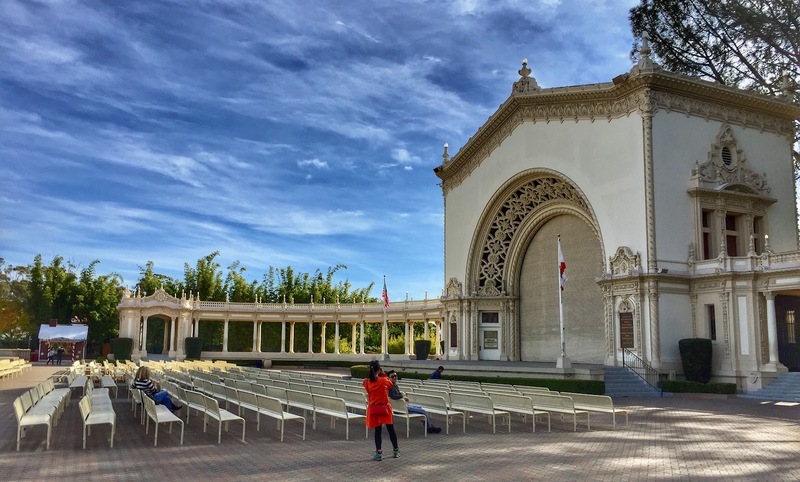 Twenty years later, the early buildings were reconditioned for another world's fair in the park, the 1935-36 California-Pacific International Exposition. A new infusion of capital also brought more structures, landscaping, and arts and cultural organizations. 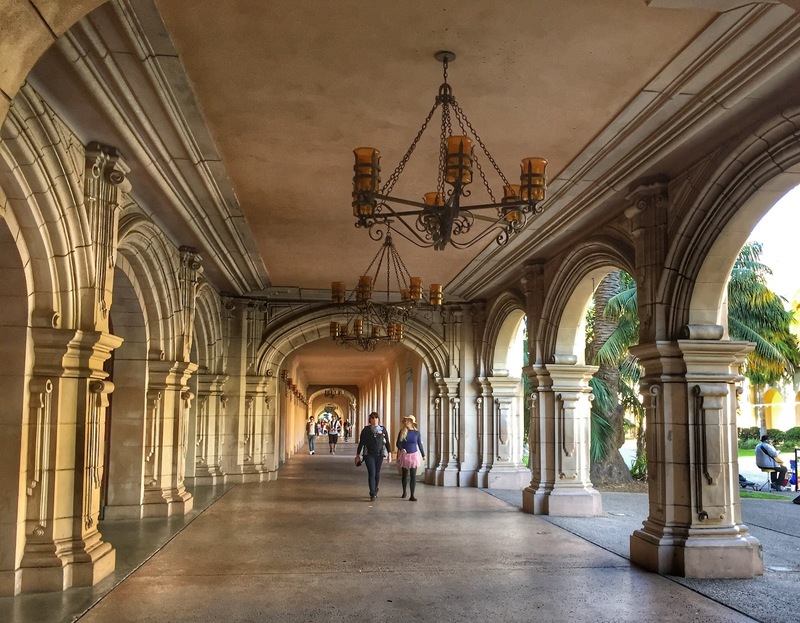 Over the years, San Diego has continued to nurture and restore the park into a world-class attraction, drawing 10 to 14 million visitors annually. ALCAZAR GARDEN DESIGNED TO PROVIDE A QUIET RESPITE FROM THE BUSTLE OF ACTIVITY. From the folk art museum, we strolled through the peaceful Alcazar Garden, whose design was inspired by 14th century Royal Alcazar Gardens of Spain. 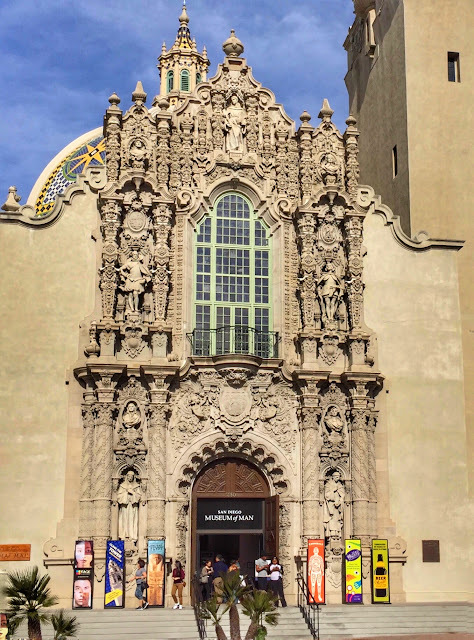 Our next stop was the Museum of Man, founded as a museum of anthropology for the 1915 exposition and housed in the most esteemed architecture in the park—the California Building. 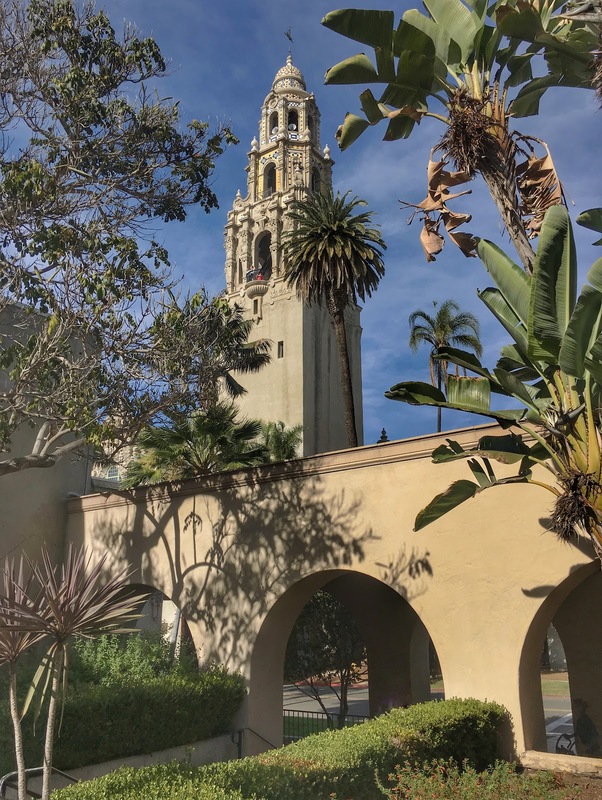 CALIFORNIA TOWER CARILLON CAN BE HEARD ALL OVER THE PARK. THE ORNATE CALIFORNIA BUILDING HOUSES MUSEUM EXHIBITS. The museum offered a fascinating range of exhibits on topics from beer-ology to monsters to race to ancient Egypt that kept us quite satisfied for an hour or more before our gastronomic appetites refused to be ignored any longer. 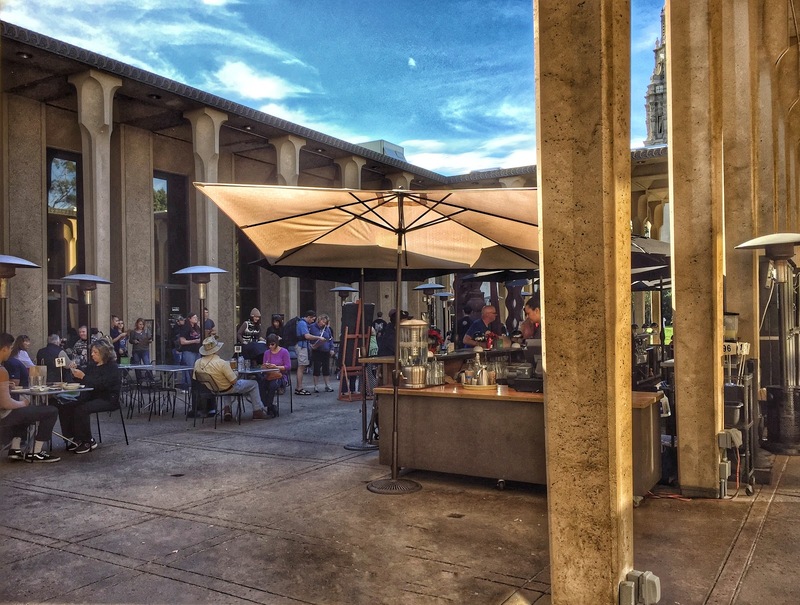 Based on the recommendation of a friendly volunteer at the visitor center, we walked over to Panama 66, the resident cafe of the San Diego Museum of Art. Though we didn't arrive until almost 2 p.m., the open-air cafe in the museum's sculpture garden was as busy as the crowded park on this blue-sky sunny day. Their clunky ordering system had patrons waiting endlessly in line, so we figured out a way to make the Grab and Go menu work for us and had completed our tasty meal long before we would have been served under the full menu system. 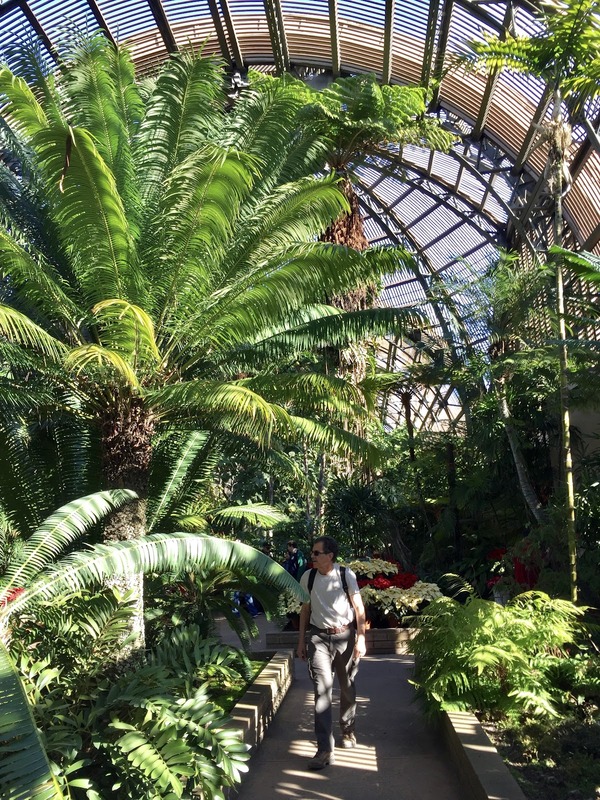 Knowing we had to make difficult choices, we skipped the art museum and ambled over to the Botanical Building. Also installed for the 1915 exposition, it is said to be one of the world's largest lath structures and houses a permanent collection of more than 2,100 plants of countless varieties. 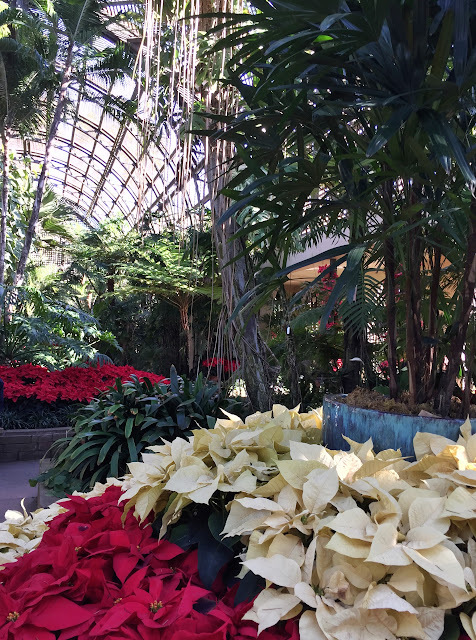 Exhibits leave space for seasonal displays, and at this time of year, the Botanical Building was festooned with red and white poinsettias. 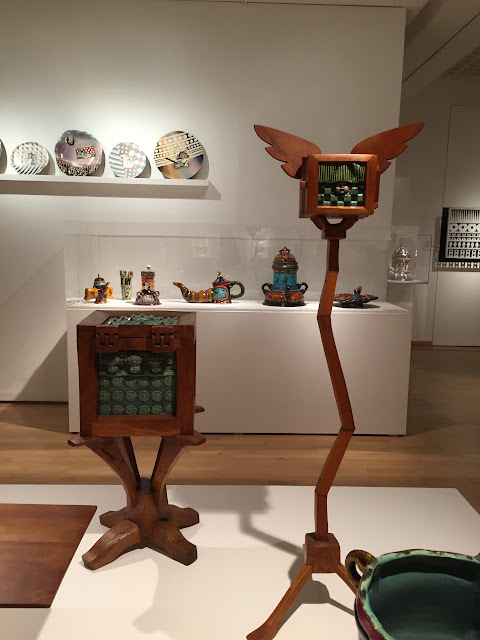 Our stop at the nearby Timken Museum of Art was brief as we found neither the architecture nor the collection inspiring, though we did appreciate its status as the only museum in the park with free admission. 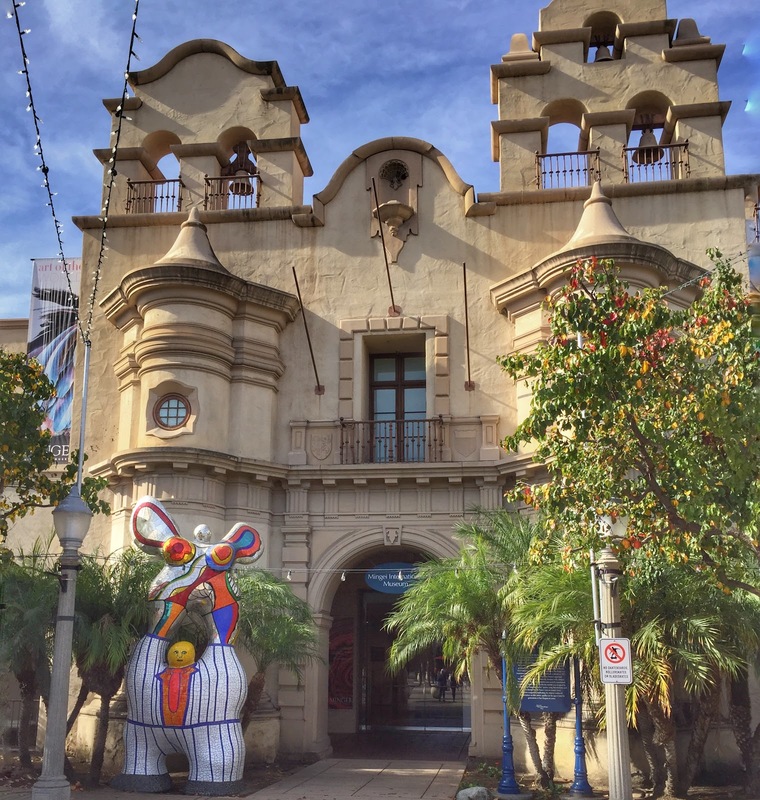 Since we both enjoy local history, we had to check out the San Diego History Center, which showcases the region's diverse history with exhibits of artifacts and artworks. As we wandered through an installation called "San Diego Invites the World", one item particularly caught our attention—the guest register of the 1915 exposition. THE GUEST REGISTER WAS LOCATED IN THE CALIFORNIA BUILDING DURING THE FAIR. In preparation of the 1915 Panama-California Exposition, the city's Chamber of Commerce commissioned a local bookbinder to create an extra large guest book for use at the event. 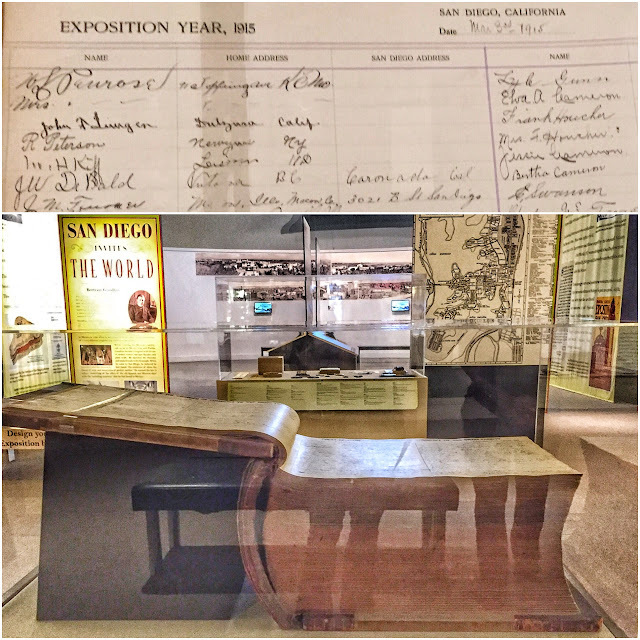 The oversized book was kept at the guest registration desk during the exposition, collecting the name, home address, and San Diego address of each visitor. Some years later, the chamber approached the bookbinder and asked to have the book cut up for scrap paper. Scandalized by the suggestion, the binder instead offered to provide scrap paper to the organization in exchange for the book, which he preserved. His company and the book later passed to his son, who donated the unique treasure to the history center in 2000. The history center's basement houses an acclaimed model railroad museum, which we were eager to see after our encounter with the display at the Mississippi Ag Museum last month. Though their set-up was a bit larger in San Diego, we missed the 'Start the Train' buttons we were allowed to press in Jackson and had to give that collection the edge. On our way back to our car, we peeked down into the tranquil Japanese Friendship Garden but we had run out of steam for exploration today. Balboa Park has so much to offer, we could have happily spent another three or four days wandering among its avenues and gardens and museums. Is it any wonder we didn't make it to the zoo? 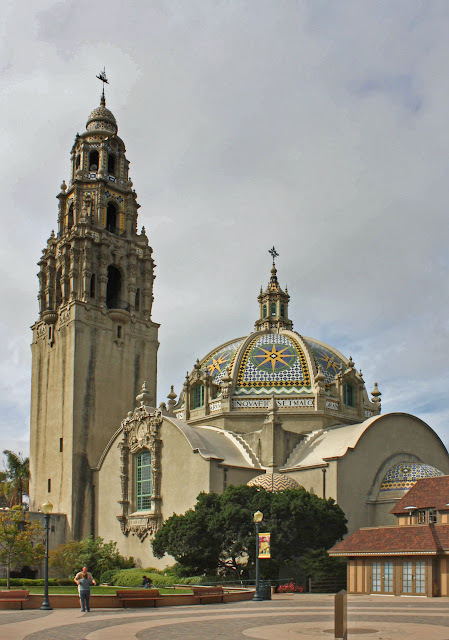 Alas, that wasn't in the cards for this trip, but the opportunity to spend more time in Balboa Park may just entice us to return to this beautiful city. 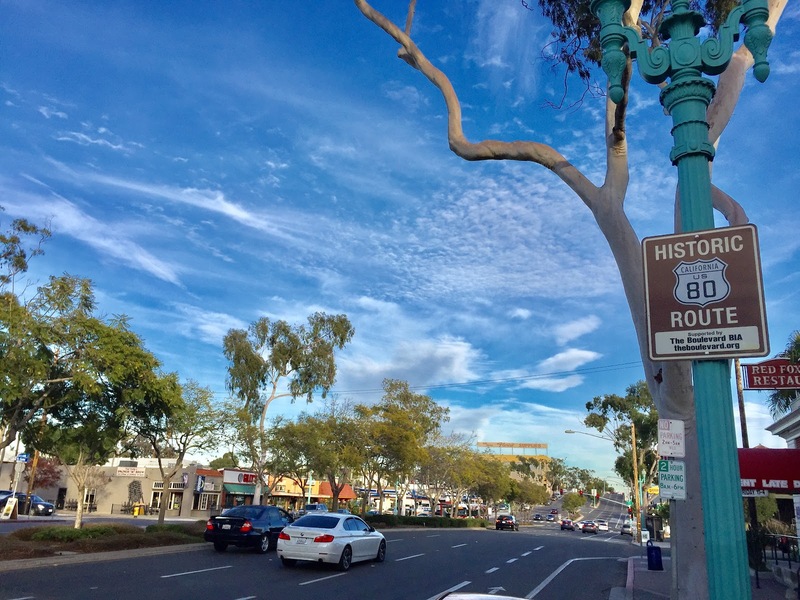 LOCALS AND TOURISTS FLOCK TO BALBOA'S MANY ATTRACTIONS. Before returning to the hotel, we tracked down one of the Historic Route 80 signs we had seen yesterday on our way to the Cabrillo National Monument for a photo op. Tomorrow we'll drive to Coronado Island to scoop up a few ounces of the Pacific Ocean before heading back east. ALL THAT'S LEFT OF US-80 IN CALIFORNIA IS A FEW SIGNS. Loved: This is a tough call. Clearly we were enamored with the work of Erik Gronborg, but we're also devoted fans of Balboa Park, so we'll have to cite both. 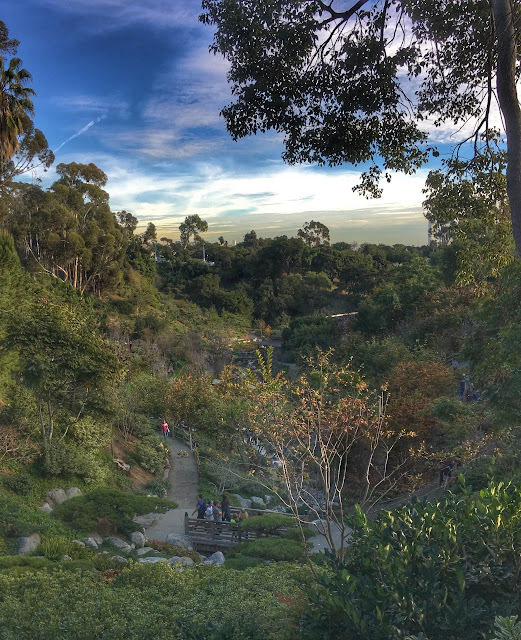 Lacking: Visiting a distinguished and expansive urban park like Balboa on which the city has obviously lavished so much funding and attention offers up a stark reminder of the glaring lack of such places in our home city of Atlanta. Atlanta's largest green space—Chastain Park—weighs in at a paltry 268 acres and offers amenities commonly found in most neighborhood parks—playgrounds, walking paths, tennis courts, and a swimming pool. A mediocre golf course, a horse park and an amphitheater complete the park's offerings. Before I finish my rant about Atlanta's lack of green space, let me just offer this comparison: San Diego has set aside 22% of its city area for parks, Atlanta, 5.9%. Learned: That there's more to San Diego than its famous zoo. GRONBORG HAS A MIND BURSTING WITH IDEAS. 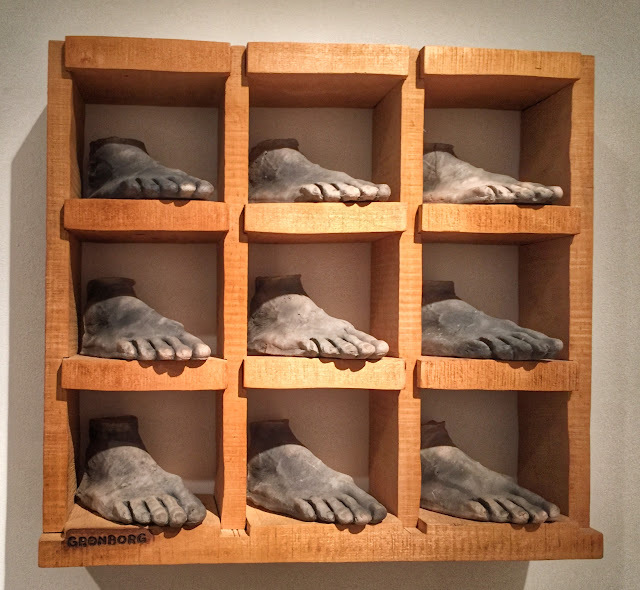 HE IS PERHAPS BEST KNOWN FOR HIS CERAMICS. AND ONE LAST GROUP OF GRONBORG'S WHIMSICAL WORK. 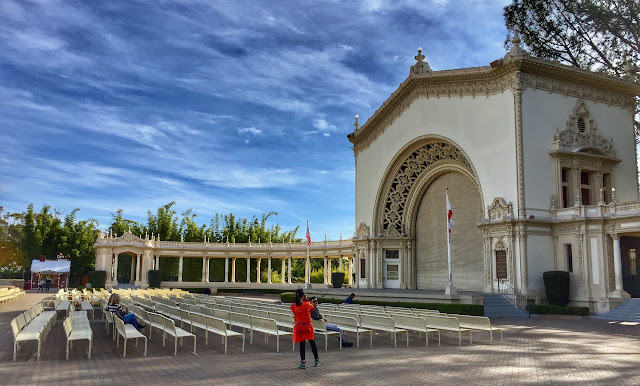 SPRECKELS ORGAN PAVILION FOR THE WORLD'S LARGEST OUTDOOR PIPE ORGAN. 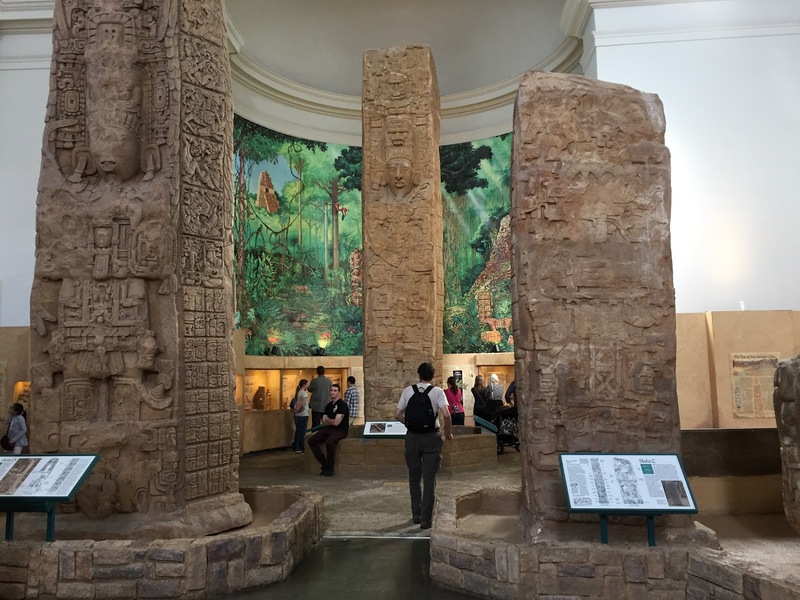 AN EXHIBIT AT THE MUSEUM OF MAN SHOWCASES CASTS OF ANCIENT MAYAN MONUMENTS.